When Matt VanDerList of Matt’s Basement Workshop was on the Wood Talk Podcast, he used to get a lot of grief about his use of exotic woods. What constituted “exotic” for Matt? Oak. Pine. Poplar. That was about as radical as Matt would get. And, every time he would say something about using those wood species because he was happy with those species, I would give him a virtual fist pump! I’m an oak kind of guy, too. Red oak is my thing, although I’ve published reports on cedar and redwood projects before. 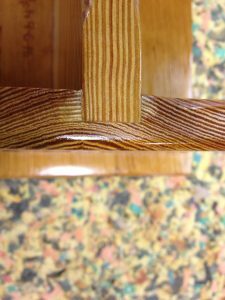 One of the challenges with oak, and other open-grained woods, is that PVA glue allowed to remain on the surface or, worse yet, soak in, will interfere with the appearance of most finishes. Everyone has his/her favorite technique for removing the glue, and we’d like to know which ones are Highland Woodworkers’ favorites. Me? I usually go with wet rag wiping. Why? Because in the heat and humidity of deep South Mississippi, glue curing is unpredictable. While I like peeling skinned PVA, I find it difficult to get the timing right. Some days 15 minutes might be just right. Other days, come back in 30 minutes, lift the ribbon of uncured glue and a puddle ensues, spreading the mess even further (at which point I reach for the wet rag). As often as not, I forget to come back and check at 15 or 30 or 45 minutes, and then there’s a massive amount of glue to remove. For me, it’s easier to just clean it right away and be done with it. Of course, there are those times when wet-cleaning pushes glue into the grain, and you’re still dealing with finish interference. That’s when I pull out the toothbrush. While this is pine, and not oak, it’s an excellent example of PVA glue interfering with the look of polyurethane finish. Did you know that you can see the residue of glue not properly cleaned with a black light bulb like your kid used to have in his room when he was going through that rebellious phase in middle school and would not let you in the room until you threatened to take the door off the hinges and give him absolutely no privacy at all. It works. The door thing, I mean. There is a better way than wet rags and toothbrushes. Apply masking tape to all surfaces where glue squeeze-out might cause difficulties. This includes boards that are to be edge-glued. Costs a little bit of money, and takes a little more prep work, but the cleanup time is much shorter, and there are no finishing problems to deal with afterwards. Promise. Frogtape is the best masking tape for this purpose since glue is less likely to get underneath it. I agree. The “Frog Tape” is good for the reasons stated and you are taping areas that don’t require glue anyway so why would you want squeeze out on those areas? Cleanup is not a problem and the prep work is a no brainer when you consider the work required to sand or wet wipe squeeze out and the extra effort to try and fix a stain problem. Now go forth and do great things! When PVA glue is dry, it is able to be removed with Acetone. don’t sand, chisel, or scrape, just brush with fresh acetone. Brush on acetone with a small brush, rubbing with the bristles until the glue disappears. It does take a few minutes if there is a lot of glue. wipe with paper towels as the glue softens. Don’t let it drip or run down below the glue spot. Final rinse carefully with clean acetone. It will remove all trace of the glue so finishes and stains will penetrate the way they should. Acetone will not scratch the wood or raise the wood grain. I’m at the beginning stages of my woodworking hobby. So far, just clean off with paper towel or wet rag. I have enough issues going on in joinery, etc where a little finish blotching doesn’t matter. So far, mostly using shellac and wax. As I get better at the joinery, I can see where I will become more demanding of the finish and likely let the squeeze out harden and then remove. Or, switch to hide type glues which supposedly remove with just warm water and a towel. I use hide glue and don’t worry about it, doesn’t have that effect on subsequent finishing. Why not give Waxilit paste a try ! Just dry fit panels, apply very little Waxilit paste along all joints, disassemble, apply glue and reassemble. Let glue-up dry, then peal off any squeeze-out. If any area requires scraping, use a sharp chisel or a scraping card. Will not cause problems with stains or finishes. I keep a box of shavings from my hand planning and use these to wipe the glue squeeze out.It works very well without having to resort to water. I learned this from Paul Sellers videos.